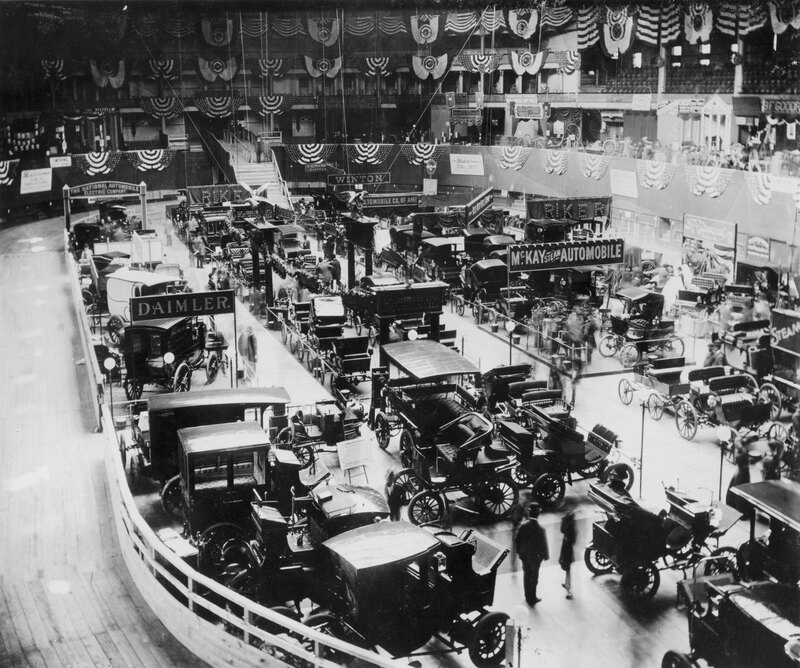 Madison Square Garden saw the first real automobile show in 1900, during the week of November 3-10. Even then people were afraid to go too close to the curious contrivances. A flat oval track was built in the arena at the Garden upon which makers might prove to the public that the things would run. People took care to sit in the galleries during demonstrations and those who wanted to cross the track did so over a bridge. A sensation was created by the discovery that cars were able to climb a wooden hill which had been made on the roof of the Garden. To run down, of. course, but really to climb up! That they did not go too fast we know from the fact that most of them were single cylinder affairs. In the obstacle contest on Monday evening Walter C. Baker, of the Baker Motor Vehicle Company, was the winner, his best time being 25 seconds. A. L. Riker, whose vehicle was driven by Ed. Adams, was second. No. 19, Automobile Company of America the winner; driver, F. W. Walsh; best time, 7 3-5 seconds. The distance run was 150 feet and the vehicle stopped in 16 feet 9 inches. There were three other entries, but only one prize was given. The other entries were: Duryea Motor Company (no time given); No. 18, Ohio Automobile Company (no time given); No. 17, Holyoke Automobile Company (no time given), and No. 20, International Motor Carriage Company (no time given). Automobile Company, best time over one minute. No. 20, International Motor Carriage Company; best time, 43 4-5 seconds. The Ohio Automobile Company and the International Company were tied for third place. A bicycle coat and waistcoat race was held November 8. Each rider rode 3 laps. No. 6, Waltham M’f’g Company (pink shirt rider); time, 237 3-5 seconds. No. 16, Canda Tricycle Company; time, 248 3-5 seconds. No. 5, De DionBouton tricycle (rider, Henry Brandt); time, 238 1-5 seconds. No. 6, Waltham M’f’g Co. (blue shirt rider); time, 247 1-5 seconds. No. 16, Canda M’f’g Company; time, 320 seconds. Final heat between Nos. 5 and 6; No. 6’s time, 233 1-5 seconds, and time of No. 5, 226 1-5 seconds. De Dion-Bouton Motorette Company, winner. On the same evening was held a contest for gasoline vehicles, in which the time required for starting was the deciding factor. In the first heat the Knox gasoline runabout made a best time of 17 4-5 seconds. In the second heat a gasmobile, of the Automobile Company of America (driven by F. W. Walsh) made a best time of 16 1-5 seconds. In the third heat the Packard gasoline carriage made a time of 20 3-5 seconds, and in the fourth heat the same vehicle reduced its time to 19 3-5 seconds. In the final heat, between the Knox runabout and the gasmobile, the former broke its chain and the gasmobile won the event. On November 9 there was a brake contest for electric vehicles, the distance being 100 feet. National Automobile Company, driven by P. B. Skillman; time, 5 3-5 seconds; distance, 12 feet 6 inches. Woods Motor Vehicle Company, driven by E. W. Curtis, Jr.; time, 6 2-5 seconds; distance, 23 feet 5 inches. No. 10, Baker Motor Vehicle Company, driven by W. C. Baker; time, 7 1-5 seconds; distance, 11 feet. Baker Motor Vehicle Company, time, 8 3-5 seconds; distance, 6 feet 10 inches. Riker Motor Vehicle Company; time, 5 4-5 seconds; distance, 14 feet 5 inches. Final heat between Riker Motor Vehicle Company and National Automobile and Electric Company: time of the Riker vehicle, 6 2-5 seconds; distance, 10 feet 7 inches. Time of National carriage, 6 seconds; distance, 12 feet 1 inch. The Riker Motor Vehicle Company was the winner. On Saturday, November 10, there was a championship obstacle contest between the winners of all three classes in the previous similar events. The results were as follows: Baker electric runabout (driven by A. C. Baker); time in first trial, 24 4-5 seconds; in second trial, 30 2-5 seconds. Locomobile (driven by S. Houston, time in first trial, 31 1-5 seconds; in second trial, 40 3-5 seconds. Gasmobile, of the Automobile Company of America (driven by F. W. Walsh), time in first trial, 28 1-5 seconds; in second trial, 36 2-5 seconds. The Baker vehicle won the event. The last contest was a championship brake contest between winners of all classes in the previous brake contests. The results were: Riker electric vehicle (Ed. Adams, driver), first trial, time, 6 2-5 seconds; distance, 14 feet 6% inches: second trial, time, 6 2-5 seconds; distance, 15 feet 11 inches. Gasmobile of the Automobile Company of America (driven by F. W. Walsh), first trial, time, 5 3-5 seconds; distance, 17 feet 6 Inches; second trial, time, 5 2-5 seconds; distance, 19 feet 5 inches. Locomobile, time, 4 4-5 seconds; distance, 27 feet 8% inches; second trial, time, 5 1-6 seconds; distance, 20 feet 414 Inches. The Rlker Motor Vehicle Company was the winner and the Automobile Company of America the second. « Vintage Review: Prince or Chauffeur? I have an original photograph of the First National Automobile Show The left hand corner reads Old Madison Square Gardens New york 1900. Do you know of anyone that may be interested in purchasing this photo? Even 100 years after the first auto show, New York continues to remain the pinnacle for auto show and exhibits.